Back in the day (or so legend tells us) a writer could improvise a four-part Doctor Who story in a weekend. Whatever the detail, Douglas Adams is known for few actual stories but plenty of ideas. 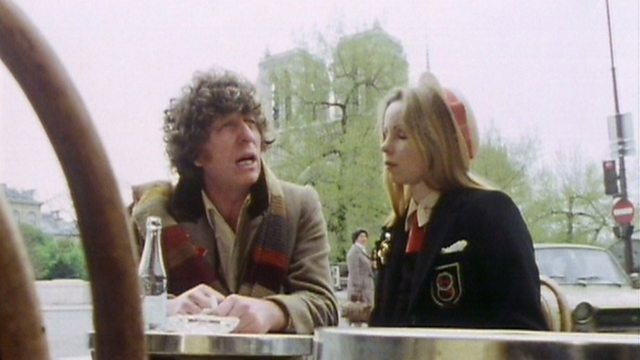 With James Goss’s adaptation fresh in the memory, and The Horror Channel offering a chance for a re-watch, what better way to spend some time than in the street of Paris with the Fourth Doctor and Romana? What better way. also, to remember the time I met Douglas Adams and chatted over a pint of beer? The Doctor and Romana become the reluctant guests of Scarlioni who is planning to steal the Mona Lisa despite having six of them hidden in his cellar – all of them genuine. Count Scarlioni is revealed to really be Scaroth, last of the Jagaroth and he is funding the construction of a time machine – but for what purpose? Scaroth intends to travel back in time to save his own people from destruction. But the Doctor can’t allow him to succeed as it would mean the destruction of all life on Earth. So this is about making sure history takes the path leading to the human race, with not only Scaroth (Julian Glover) being unable to change his own fate, but also grander issues at stake such as the start of life on Earth. The story moves along at some pace yet also manages to make time to introduce other characters such as Duggan (played by Tom Chadbon who Big Finish has used a lot recently in their Blake’s 7 ranges), the Countess (Catherine Schell — Maya in Space: 1999), the art gallery visitor (played by John Cleese) and the biggest star of all, Paris itself. Oh and there’s Tom Baker and Lalla Ward dressed as a school-girl. The plot is strong and riddled with originality; the time fragmented alien influencing humanity and able to provide a new type of foe for the Doctor is the main strength. 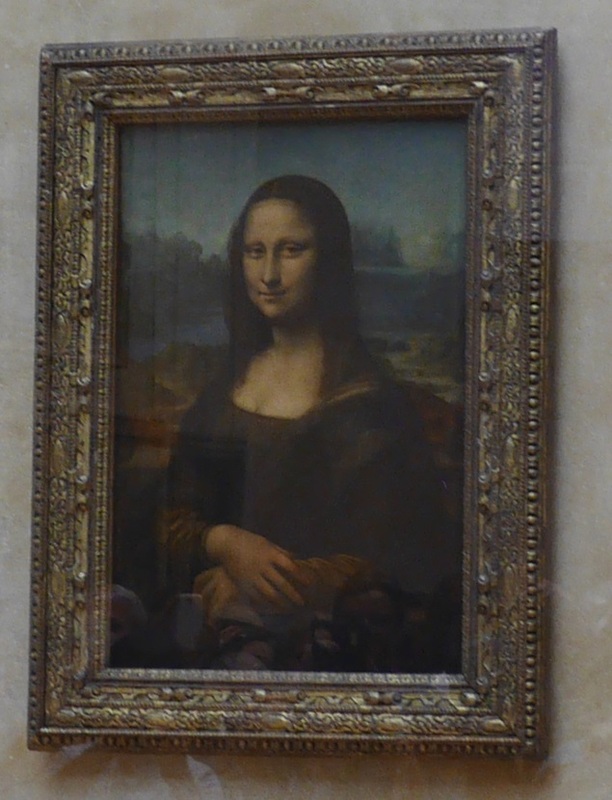 This also leads to the wonderful conceit of the multiple copies of the Mona Lisa (recent photo to the left) and a chance to work Leonardo in as well! Yes there are token guards, a mad scientist and a curious portrait artist but also the self-deluded wife. We may laugh at the rubber mask and the wonky eye of the alien form of Scaroth, but these shouldn’t remove anything from the recognition of just how much this story brims with ideas. The photography is languid and spends a lot of time demonstrating that, yes indeed, they are in Paris. Away from all the boulevards and the Eiffel Tower, we have very few sets – a café, a mansion (cellar laboratory and sitting room), the Louvre, another gallery and the distant past. An interesting contrast then between usual BBC economy and the indulgence of an entire city to play with. In some ways this echoes the ill-fated Shada, happy to set the scene with punting then rushing off to the action. Much of the story may be simply painted – Duggan is a substitute sonic screwdriver in many ways, but this allows other elements to shine. The balance of authority between Romana and the Doctor is also interesting; Romana is not just following the Doctor around blindly (OK she does a bit) but also has her own thoughts on what to do, her own (K9-like) observations on the size of the cellar, but more important she has her own relationship with Duggan’s character. This is quality storytelling. While the TV story works well, watching it again lets the viewer realise how good a job James Goss has done with his novelisation – he fleshes out a lot of the characters and rounds out the whole piece with a real subtle talent [James – if you’re reading this you’ll just have to blush!]. It all adds the sense of potential in this story. With apologies for a (rare) personal digression, I thought I’d mention [inlinetweet prefix=”” tweeter=”” suffix=””]the time I had a beer with Douglas Adams[/inlinetweet]. Back in 1980, Saturday, September 27 (there are reasons why I know the date, but they are not relevant to this post) I was at a science fiction convention in Glasgow – Hitchercon. Some dozens (maybe more) of fans gathered at the Albany Hotel to chat Hitchhiker, attend some talks and get a preview of the first episode of the forthcoming TV series. At one point on the afternoon I collared Douglas Adams at the bar and bought him a beer and sat down for a chat. Back in 1980 I was not focussed on Doctor Who but did manage to talk about something not connected with science fiction – Cambridge University. I was about (the following week) to become a fresher at Downing College. In talking about time at university, he asked where I was going; I named Downing and he made a comment about Is that a college? Seeing he’d offended me, he went on to explain his good friend John Cleese had been at Downing and he [Douglas] had only been teasing me. We continued to chat and there you have it, my beer with Douglas. Looking back there are a million and one things I could have asked, but at least there is a tangential connection to Doctor Who and John Cleese’s cameo in CIty of Death! ← What the HHGTTG is going on with series 9?